In what we’re told is a nod to The War Eagle Reader–we used the same language last week— the most outgoing Krystal marquee in all of Auburn turned its attention toward Georgia on Wednesday by asking the Tigers to upsize their game against the Bulldogs. We’re hoping all the positive vibes returns Auburn to a marquee program. And we will follow this story forever. 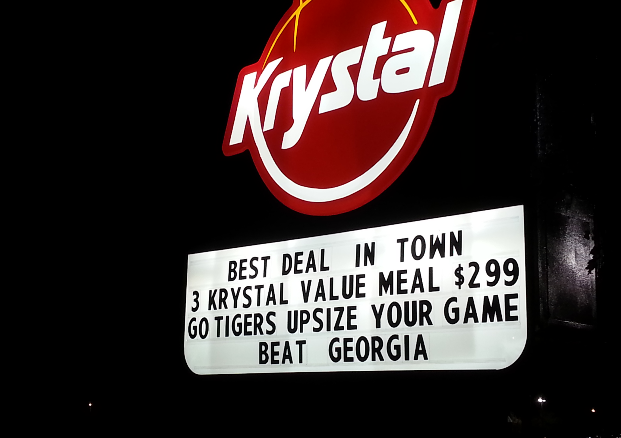 Related: After a week of tough love, Krystal marquee gives Auburn its due.